Being primarily a Java developer I was spoilt by the garbage collector of the JVM and therefore I had to face memory management issues when I started learning Objective-C for the iPhone, because that runtime doesn't have a garbage collector. When an app crashes in most cases access to already released objects is the cause and there are two symptoms which refer to this fact, so let's see who they are and when they occur based on an example related to RestKit. // Here creation and initialization of the params dictionary, etc. The last step fails with EXC_BAD_ACCESS, because the desired object has been released, its assigned memory freed, but not allocated for another object. We definitely didn't have to do anything with objects of type __NSCFType (it could be __NSCFSet, __NSArrayM, etc), so this is a precise indicator of an object stored on an unwanted memory area. Now, this is enough information to solve the issue. Thanks a lot! This works for me. I enabled the Zombies and detect the problem. Hey Nice post... been looking for this information for a while now... I have a few doubts about zombies though. 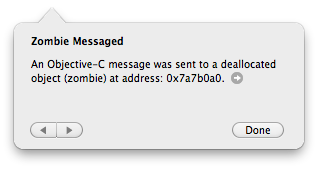 Zombies will show only when the device is connected to xcode right? For that I need to able to simulate the crash. Which is something I am unable to do. My Code is quite extensive and the app is crashing in production. Looking for deallocated objects in the code manually is like looking for a needle in the haystack.. Any Suggestions??? Yes, Zombies can only be identified when using a device. 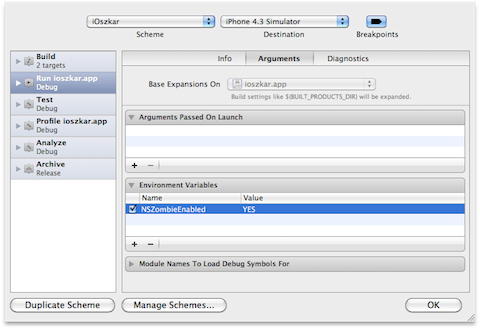 Since your app is already in production you have access to the crash call stacks, which you can symbolicate, thus allowing for a reproduction of the steps. - convert your project to ARC.